Norman Porter was born in Hamilton to James Porter and Louisa Sturgess in 1892. A year after Norman’s birth, James Porter was insolvent. Sometime afterward, he left Hamilton and his family to work as a miner. Meanwhile, Louisa and the family were living at Wallacedale. Eventually Norman also went off mining in the Broken Hill area. There he married local Elizabeth Moore Stipeck in 1913. The NSW Birth Index, lists a daughter, Ethel Mary born in 1913. On 14 September 1914, at Pontville Tasmania, Norman enlisted. Presumably, mining took Norman to Tasmania Elizabeth and young Ethel remained in Broken Hill. Norman left Melbourne via Albany, Western Australia for Egypt on 22 December 1914 with the 12 Battalion. It was also during that time his mother Lousia Porter heard from her husband James for the last time. He disappeared, and it was later presumed he was dead. “WITH THE COLOURS.” Hamilton Spectator (Vic. : 1870 – 1873; 1914 – 1918) 19 Jun 1915: 4. Web. 14 Dec 2015 <http://nla.gov.au/nla.news-article119844893&gt;. After telling his mother he was “slightly wounded” he went on to describe the events leading to his injury. As they came into shore, his “best pal” was shot in the boat beside him. Norman then rushed on to the beach amid gunfire and fell in a six foot deep pit dug by the Turkish soldiers. With others, he waited until just before dawn then charged at the first trench with bayonets. A shell landed near Norman wounding his leg. For two hours he lay in his clothes, still wet from the landing, shivering while bullets whistled overhead. He crawled under a bush and lay there until a stretcher bearer came. One was shot while carrying Norman, so the remaining stretcher bearer carried Norman the best he could to the beach for transfer to the hospital ship. Once in hospital in Egypt, Norman continued, doctors discovered he had rheumatism brought on from his cold wet clothing after the landing. He told his mother, seemingly with no regret, that he did not expect to return to the front. At the time of writing, Norman thought most of his battalion was wiped out and many of his friends dead. You can read the full article containing Norman’s letter here. Norman did find himself on Gallipoli after his hospital stint. He joined his unit on 6 August 1915, the first day of the Battle of Lone Pine and the unit diary shows reinforcements arrived on that day. The 12th Battalion put forward two companies of men for the battle. 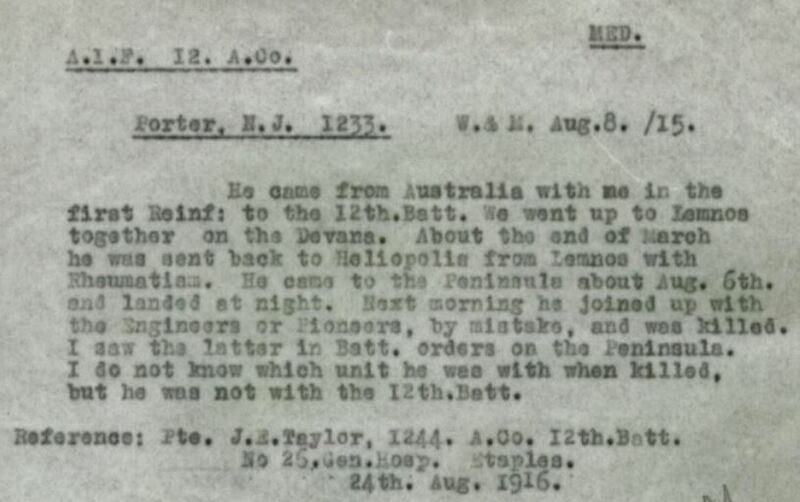 On 6 August,at 7.20pm, the 12th Battalion received a message. They were going to reinforce 1st Brigade who made the first attack at 5.30pm. At 7.42pm, the battalion was in place on Gun Lane. Over the following days until the afternoon of 10 August, the 12th Battalion rotated between reinforcing and rest. 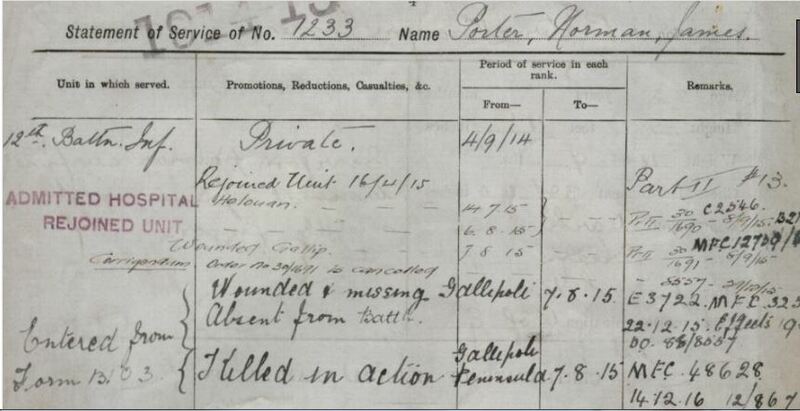 At around 8.00am on 8 August, Norman was seen to receive wounds to the head from either a bullet or shell. He was killed and buried at Brown’s Dip, around 450 metres from Anzac Cove. An investigation into his disappearance eventually began. The witness statement below, signed Pte J.E. Taylor, not only discusses the events of the day, but Norman’s movements prior to August. The informant believed Norman was not with the 12th on the 6 August, but instead got mixed up with Pioneers and Engineers due to the chaos of the day. 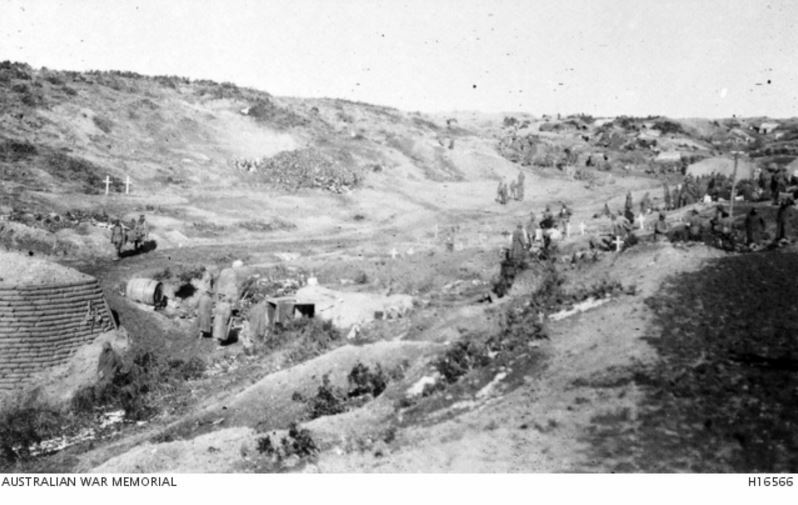 Other witnesses said Norman was in the charge at Anzac Cove on 6 August, made it to the Turkish trenches and seen after the trenches were captured on 7 August. Another witness said Norman was hit in the back of the head with shrapnel about 8:00am on 8 August. The witness account from J.E. Taylor is interesting in that it supports Norman’s service record somewhat, but leads to some questioning about Norman’s seemingly credible letter. It also highlights discrepancies in the WW1 service records. On investigation, J.E.Taylor, Service No. 1244 was actually James Ernest Turner. At the time of writing his account, he was in hospital at the No. 26 General Hospital in Etaples, France. Just days earlier he was shot in the hip. James said he and Norman had been on Lemnos together, sailing on the SS Devanhah. The 12th Battalion unit diary shows the battalion left Alexandria on 1 March 1915 aboard the SS Devanhah arriving to the island of Lemnos on 4 March. He also said Norman left around the end of March for hospital because of rheumatism. James Turner was killed in Belgium on 3 November 1917. Looking at the following record, it indicates Norman rejoined his unit on 16 April, just in time for the Gallipoli landing. It also shows he didn’t go to hospital until 14 July 1915. 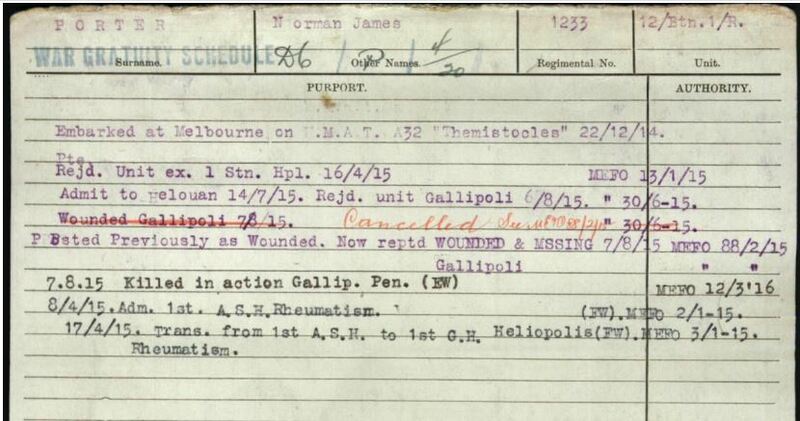 The next record shows Norman admitted to the 1st Australian Stationary Hospital (1st ASH) at Lemnos with rheumatism on 8 April 1915 then rejoined his unit from the 1st ASH on 16 April. However it also shows he transferred from the 1st ASH at Lemnos to 1st General Hospital at Heliopolis, Egypt for rheumatism on 17 April, making it unlikely Norman was at the Gallipoli landing. The confusion continued. 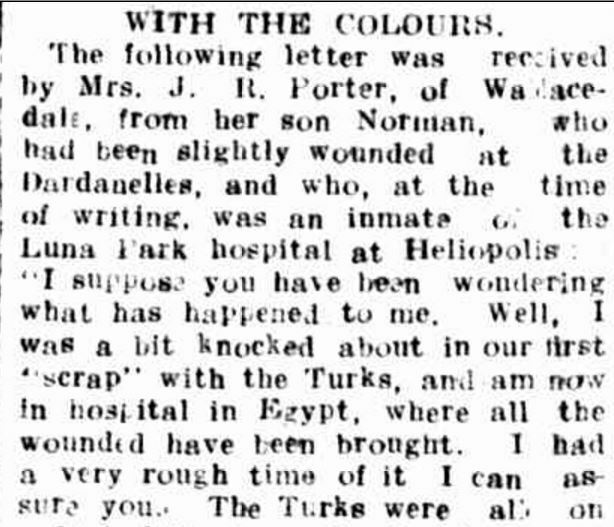 A letter dated 1 September 1915 was sent to Norman’s wife Elizabeth with the news he was wounded although not seriously. On 21 November 1915, Elizabeth wrote to the Defence Department as she had not heard from Norman or heard more on his condition. By August 1916, it was official. Norman Porter was killed on 8 August 1915 at Lone Pine. Elizabeth had already remarried to Gordon Wright and had a baby on the way. Norman’s daughter Ethel married in 1938 at Broken Hill to Wilfred Connolly. His mother, Louisa Porter died at Hamilton on 3 July 1931. In 1923, Norman Porter was exhumed from his grave at Browns Dip and buried in the Lone Pine Cemetery. He is remembered on the Hamilton War Memorial. I would like to thank Merron for researching and putting together this piece on Norman together as found this very informative and very sad as I have been working on my family tree on my Sturgess side of my family line. It was interesting to find out about Norman and also his father, as I had been very curious about what had happened to his father, and the closest I had come was that there was a miner buried at Wallacedale by the name of James Richard Porter, on the 1st December of 1914. Either that or he died that day. Also I didn’t think that there was a cemetery at Wallacedale and I didn’t find his grave at the Branxholme cemetery.